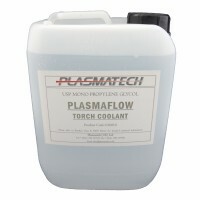 Supplied in traditional 5litre containers, providing over 30% more coolant than that of an OEM labeled US gallon, PlasmaFLOW is Cutting the cost of Cutting as a competitively priced universal plasma torch coolant, manufactured in the UK. Having been initially produced for use in Kaliburn plasma cutting systems,and made to the exact same specifications as the OEM product so as to maintain the same quality, PlasmaFLOW is also widely used in Hypertherm and other water cooled plasma cutting systems as well as being suitable for water cooled MIG, MAG and TIG welding systems. Why pay more money for less product? ?Supplied in an economical 5litre containers, PlasmaFLOW provid..